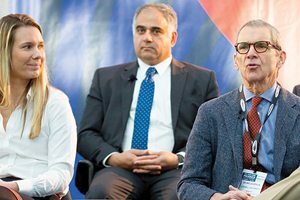 New York Produce Show exhibitors, attendees and buyers rose bright and early on exhibit day to enjoy the show’s Keynote Breakfast and the Perishable Pundit “Thought Leader” Panel in the beautiful Jacob Javits Center River Pavilion. The New York-inspired breakfast was all the more festive with the energizing doo-wop harmonies of the acapella Tee-Tones. Following the invocation and national anthem, Eastern Produce Council president Vic Savanello introduced EPC board members and paid tribute to those who passed away in 2017, Sal Zacchia, Thomas Krulder and industry icon Joseph Procacci. Savanello also announced the new EPC-Rutgers Leadership Program for 2018. In closing, he introduced a new video by the New York State Department of Agriculture and Markets on its new New York State Grown & Certified program. 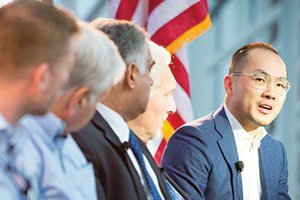 PRODUCE BUSINESS president and editor-in-chief Jim Prevor delivered a short address, followed by the awarding of several awards (see page 9 for more information). He then invited the thought-leader panelists to share insights on innovation, ideas, and practices to help elevate the produce industry. Morton Williams brings a unique perspective as a New York City retailer, with many customers shopping daily for one item rather than loading a shopping cart. Produce director Marc Goldman pointed out the appeal of value-added items such as cut vegetables and fruit because “people don’t have room to buy lots of fruits and vegetables to store in the refrigerator.” He also mentioned that Morton Williams gives new products a chance but quickly removes them if they’re not selling well. How important is customer interaction? John Vasapoli, director of merchandising-produce, D’Agostino Supermarkets, commented that the local store is key for building customer relations. Direct customer interaction is highly important to McCaffrey’s Markets, which views itself as being in the people business. Its produce departments try to seduce customers with the magic of retail. “Our business is simple; we need to connect with customers. Expanding grab-and-go, for example, would be a mistake because it would take away that interaction,” said Tony Mirack, McCaffrey’s produce/floral merchandiser director. As a market researcher, Sharon Olson specializes in consumer data pertaining to foodservice. She pointed out the prevalence of purchasing food away from home is changing the industry. PF Chang’s sees itself as a point of entry into retail produce and relies heavily on grower/shippers for items on its vegetable-forward menu. “We seduce customers by telling stories of where items are coming from and how they are prepared,” said Robin Fisher, category manager. Students are driving changes in the industry as they continue to demand more local, fresh and sustainable items, elevating the quality and variety of produce utilized at colleges and universities. Josh Padilla, produce director, Alpha 1 Marketing, stressed the importance of communication between vendors and retailers, using technology as a tool for helping introduce and promote products. Fruitday Co., Ltd., China’s largest fresh fruit e-commerce company, strives to be closer to its customers. Asked to comment on the future direction of the industry, Ed McLaughlin, of Cornell University’s Cornell SC Johnson College of Business, predicted continued disruptions such as the rise of discounters Aldi and Lidl and the prowess of Walmart and Amazon/Whole Foods.